Stanford University scientists have invented the first high-performance aluminium battery that's fast-charging, long-lasting and inexpensive. Researchers say the new technology offers a safe alternative to many commercial batteries in wide use today. "We have developed a rechargeable aluminium battery that may replace existing storage devices, such as alkaline batteries, which are bad for the environment, and lithium-ion batteries, which occasionally burst into flames," said Hongjie Dai, a professor of chemistry at Stanford. "Our new battery won't catch fire, even if you drill through it." Dai and his colleagues describe their novel aluminium-ion battery in "An ultrafast rechargeable aluminium-ion battery," which will be published in the April 6 advance online edition of the journal Nature. Aluminium has long been an attractive material for batteries, mainly because of its low cost, low flammability and high-charge storage capacity. For decades, researchers have tried unsuccessfully to develop a commercially viable aluminium-ion battery. A key challenge has been finding materials capable of producing sufficient voltage after repeated cycles of charging and discharging. For the experimental battery, the Stanford team placed the aluminium anode and graphite cathode, along with an ionic liquid electrolyte, inside a flexible polymer- coated pouch. Aluminium batteries are safer than conventional lithium-ion batteries used in millions of laptops and cell phones today, Dai added. "Lithium-ion batteries can be a fire hazard," he said. As an example, he pointed to recent decisions by United and Delta airlines to ban bulk lithium-battery shipments on passenger planes. "In our study, we have videos showing that you can drill through the aluminium battery pouch, and it will continue working for a while longer without catching fire," Dai said. "But lithium batteries can go off in an unpredictable manner – in the air, the car or in your pocket. Besides safety, we have achieved major breakthroughs in aluminium battery performance." One example is ultra-fast charging. Smartphone owners know that it can take hours to charge a lithium-ion battery. But the Stanford team reported "unprecedented charging times" of down to one minute with the aluminum prototype. Durability is another important factor. 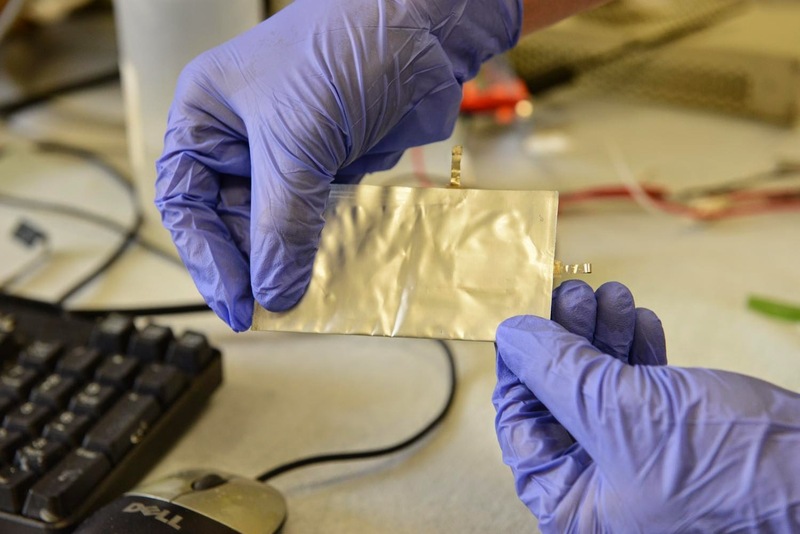 Aluminium batteries developed at other laboratories usually died after just 100 charge-discharge cycles. But the Stanford battery was able to withstand more than 7,500 cycles without any loss of capacity. "This was the first time an ultra-fast aluminium-ion battery was constructed with stability over thousands of cycles," the authors wrote. By comparison, a typical lithium-ion battery lasts about 1,000 cycles. "Another feature of the aluminium battery is flexibility," Gong said. "You can bend it and fold it, so it has the potential for use in flexible electronic devices. Aluminium is also a cheaper metal than lithium." In addition to small electronic devices, aluminium batteries could be used to store renewable energy on the electrical grid, Dai said. "The grid needs a battery with a long cycle life that can rapidly store and release energy," he explained. "Our latest unpublished data suggest that an aluminium battery can be recharged tens of thousands of times. It's hard to imagine building a huge lithium-ion battery for grid storage." Aluminium-ion technology also offers an environmentally friendly alternative to disposable alkaline batteries, Dai said. "Millions of consumers use 1.5-volt AA and AAA batteries," he said. "Our rechargeable aluminium battery generates about two volts of electricity. That's higher than anyone has achieved with aluminium." But more improvements will be needed to match the voltage of lithium-ion batteries, Dai added. "Our battery produces about half the voltage of a typical lithium battery," he said. "But improving the cathode material could eventually increase the voltage and energy density. Otherwise, our battery has everything else you'd dream that a battery should have: inexpensive electrodes, good safety, high-speed charging, flexibility and long cycle life. I see this as a new battery in its early days. It's quite exciting."